This week marks the first anniversary of Yadid’s Bar Mitzvah. It is hard to believe that he is about to be 14 years old and in a few short month he will be off to high school. To mark this moment I wanted to share the Dvar Torah Yadid gave at the ceremony he had at our synagogue. When I was in Toronto, for my cousin Eliyahu’s Bar Mitzvah, our friends the Horowitz’s suggested I go to a high quality, low cost tailor nearby. I went to the tailor and I tried on a couple of suits. While wearing the suits I felt like a king. I started thinking about how clothes affect how people are seen and see themselves. My sister, Emi, can be intensely focused on her clothes and has said, “ Clothes is life”. While I was learning with Rabbi Marder I had a thought that clothing has a role in helping people connect with the the idea of majesty. But how? You might ask. In this week’s Torah portion, Tetzaveh, we see an elaborate description of the Bigdei Kehuna. Part of the Bigdei Kehuna is a vest that is turquoise- Techelet, gold and purple (Exodus 28:6-8). Like the blue color of a hyperlink linking web pages the Techelet connects the Cohan’s clothing to the Techelet in our ancestor’s tzitzit, eventually to G-d’s Kisei Hakavod– saphire heavenly throne. Now we see that our ancestors looked at the Bigdei Kehuna and saw a representative of God in heaven. What does it mean to represent God? In regard to this I wanted to share an interesting piece by Kafka. He wrote, ” The emperor of the imperial sun sent a messenger out with an important message; a strong indefatigable man running through the crowd. Every time the messenger met resistance he would point at his breast which bore the sign of the sun- the king’s symbol and people would get out of his way ( Emperor of China). Maybe this is why my Abba is always getting on my case about wearing tzitzit? So when our ancestors saw the Kohen Gadol they saw a representative of God. If that is how our ancestors saw the Kohen Gadol, how did the Kohen Gadol see himself? We read in Tetzaveh that the Kohanim were dressed like this because, “ l’kavod uLetriferet” (Exodus 28:2). Meaning they were dressed up for honor and splendor. But whose honor and whose splendor? Who? The Kohanim, God, or even B’nai’ Israel? The answer is, likely, that it was for all three. The Kohanim are singled out and special. How could they not see themselves as special sporting the tekhelet and the special robes? The symbolism of clothing, and its connection to both honor and position, is very much present in this week’s Haftorah as well. King Saul has failed to carry out G-d’s instructions and the Prophet Samuel announces that HaShem has now rejected Saul as king. Samuel turns away to leave and Saul grabs Samuel’s tunic, ripping it. In response to that Samuel said just like this, “HaShem has ripped the kingship of Israel away from you today.” Here we see that the clothing carries the full symbolism of the role. In the words of the Bard, “Spend all you can afford on clothes, but make sure they’re quality, not flashy, since clothes make the man” (Hamlet). Saul admits to his wrong doing, then begs Samuel to not embarrass him in front of the elders of the people. He pleads Kabdeni– for his honor. We hear the root Kavod here, echoing the use in the description of the Kohen’s clothing, “l’kavod ultifaret” and G-d’s Kisei Hakavod – heavenly throne. Saul is not worried about how he represents God’s honor, only how his honor is perceived by B’nai Israel. Unlike in this week’s parasha,Torah portion, when the Kohanim are serving God to honor God, Saul, having lost God’s favor, is not focused on how he represents God as the king. Rather, Saul is more concerned with how being king represents him in front of the people. Sad for Saul. Interestingly we see a similar discussion in Megillat Esther which I will be reading tomorrow at my Bar Mitzvah ( Yadid’s Bar Mitzvah was celebrated the next day on Purim). Achashverosh wakes up in the middle of the night and he has the book of chronicles read to him. It is brought to his attention that Mordecai saved his life and was never recognized or rewarded for this. Achashverosh asks Haman: “מַה לַעֲשׂוֹת בָּאִישׁ אֲשֶׁר הַמֶּלֶךְ חָפֵץ בִּיקָרוֹ- What he should do “to honor someone the king wants to honor” ( This was according to Onkelos’ translation of yakar as kavod )? Haman says that the man should be dressed in the king’s clothes, wear the king’s crown and be paraded around Shushan on the king’s horse. The king agrees – well, sort off. He says that Mordechai should be led around with the king’s clothes and the king’s horse. Notably, he excludes the crown. By Haman’s asking for the crown and the king excluding the crown we can see that both Haman and Achashverosh see the crown not just as another accessory of his outfit, but wearing the crown has symbolic value which means that the person donning the crown is king. The clothing themselves imply something royal, and that crown seals the deal. So, what connects our three texts? And how do they help our understanding of the concept of honor? In the Megillah, on a superficial way honor can be worn, but it is much harder to actually attain. In the haftorah, we learn that even if one is stripped of kingship, one should not be stripped of honor. There is a baseline of honor due to everyone, even someone who has failed God. In Tetzaveh, the clothing is there for honor as well, but it less so to demand respect as to a king then to inspire a connection to the King. The berachah, blessing, for seeing a king is Shechalak Mikvodo lebasar v’dam– that G-d has shared some of his honor with flesh and blood. When you see a king you should honor them- give them kavod. I can imagine at the moment of my being faced with a real life King- l’kavod uLetriferet with all of their pomp and circumstance I would be overwhelmed. The very nature of taking this moment to make a beracha to God reframes the experience. Like our ancestors, we can double click on the Techelet from the Bigdei Kehunah and be taken to an image of God’s Kisei Hakavod – heavenly throne. The honor due to do a King is but a helek, a part, of God’s infinite honor. It is true that we are all created B’Tzelem Elochim, in the image of God, and when we see a King we get a chance to see a magnified version God’s majesty. This blessing gives us a way to give a flesh and blood king the proper respect regardless of their imperfection. This is like what we learn from Samuel. It also reminds us never to be fooled like Haman and Achashverosh into thinking that majesty is as simple as wearing a crown. But how do we make sense of this blessing in light of the Megillah and in our world in which God is often hidden from view? As we will read in the Megillah tonight this corrupt world view leads to thinking that people can be bought and sold with no respect of their divine nature. Perhaps this is why we dress up in costume on Purim. In the absence of perceived God we can project an ideal that clothes might inspire us to seek out God and dress ourselves in the moral fabric that ensures that we treat everyone with respect and honor. And when I stand here today in my Bar Mitzvah suit, I feel a little majestic. My family and friends are here from all over the world to celebrate me. But I take this moment to realized that clothes should inspire us to emulate something greater not make us think we are greater. Thank you Rabbi Marder for helping me with my speech, thank you everyone for joining me for this coronation of sorts. Thank you Abba and Mami for helping me with troupe, planning and more, and thank you Shama, Emi and Libi for cheering me up when I was down and helping me see myself for what I can be with or without a majestic suit. Shabbat Shalom and have a majestic Purim. I am still so proud of my majestic son. To quote from a book that my family enjoyed reading together “If every person in this room made it a rule that wherever you are, whenever you can, you will try to act a little kinder than is necessary – the world really would be a better place. And if you do this, if you act just a little kinder than is necessary, someone else, somewhere, someday, may recognize in you, in every single one of you, the face of God.” Wonder by R.J. Palacio. In preparation for today I wanted ( or at least my Abba wanted me to) do a siyum. Over the last year I have learned Masechet Megillah as part of my Bar Mitzvah Bucket list. I wanted to share a short shiur– lesson as a completion of what my father and I learned. When Haman goes to get Mordechai to dress him in the king’s clothes and parade him around town, he finds Mordechai himself giving a shiur to the Sages on the halakhot – laws of kamitzah. What you say is the kamitzah? Good question self. Well the kamitzah was the three finger measurement of fine flour used in the meal offering in the Temple in Jerusalem. When Mordechai sees Haman he tells the Sages to leave so they don’t get burned by his coals. Which is interesting in that part of the meal offering itself, but back to the story in the Gemara. Mordechai bravely stands alone before Haman, puts on his tallis and starts davening. We are left with a bizarre image of Haman patiently waiting for his mortal enemy to finish his prayers while Mordechai thinks he is about to be killed. After Mordechai finishes, Haman tells him that the king has commanded him to clothe Mordechai in the king’s clothes and parade him around town on the king’s horse. Mordechai says that he can’t do that because he is dirty and needs a haircut. Why is he dirty and need a haircut? Excellent question self. Seeing that his fortune has changed from nearly being killed to being paraded around town by his enemy – Mordechai leaves his state of mourning and starts to toy with his adversary. While that occurs Esther closes all the barbershops and bathhouses. She is mean that Esther. While doing so Haman’s daughter, lets call her Antikke is standing on a roof and sees Haman walking and Mordechai on the horse. Antikke thinks that the person being lead around in the King’s clothes is Haman her father and the person leading him around is Mordechai. Thinking it is Mordechai from that distance she throws a chamber pot full of poop onto her father’s head. 1) There are many perspectives in this story that are alternating between comedy and tragedy. In the beginning of the story Mordechai’s perspective is that he is about to be killed. Antikke’s perspective is that she thinks she will punish her father’s enemy but instead punishes her father. Throughout the Megillah it seems that G-d isn’t actually present, especially in this story we, with the reader’s perspective see a majestic plan unfolding. 2) I as a reader find it problematical that the so called victims of the story are mistreating people. For example Esther’s effort to close the barber shops and showers just seems cruel in that it is engineered to shame Haman. Similarly when Mordechai kicks Haman. He didn’t just kick him, he responds to a Torah quoting Haman by dismissing him outright, being mean spirited and being dismissive of non- Jews. This is resonant with what we see at the end of the eighth perek when the Megillah. There we read “Moreover many from among the people of the land declared themselves Jews, for the fear of the Jews had fallen upon them.”( Esther 8: 17) I appreciate that they were feeling oppressed, but why do they need to make others feel oppressed? This is especially troubling because of current events where groups are being persecuted as in the Megillah. I hope that we come together as a nation to end persecution of anyone. The root of hatred is fear, we cannot fight it with more hatred, only with more love. This can only happen when we don’t tolerate bad behavior but also don’t behave badly ourselves. We have to strive to keep the highest standard of conduct. 1) In this sugya as in life the line between comedy and tragedy is perspective. As Abraham Lincoln said- We can complain because rose bushes have thorns, or rejoice because thorn bushes have roses. In becoming a Bar Mitzvah I think about this quote whenever something goes wrong or someone does something wrong. I remind myself to regain the right perspective so that I can bring my best self. I try to do this because, lets say if, not that this ever happens, but imagine that Shama and Emi are fighting, and no one was around. They both tell my mom what happened individually and no matter how hard they try, they will tell the story slanted towards themselves. So in order to hear what really happened you have to see the situation from both perspectives. In any conflict there are always three perspectives: his side, her side and the truth. I think this is why my family liked Wonder so much, because every chapter was told was a different perspective. 2) The other big idea is that we have to be just in our ends and our means. As we saw in this sugya even Mordechai himself might confuse the blessed Mordechai with cursed Haman in being unnecessarily cruel to his adversary. It is a hard lesson to learn for myself or even for our people but I realize that being the victim is never an excuse for behaving poorly. Thank you friends and family for helping me get through this journey of sorts. Thank you all who came from out of town, from Canada to Argentina. Thank you Abba for learning Masechet Megillah with me and helping me with this speech, thank you Mami for teaching me troupe and the Mincha service, thank you both of you for helping me navigate through this strange world and thank you Shama, Emi and Libi for cheering me up when I was down, and making me feel proud of who I was, from any perspective. 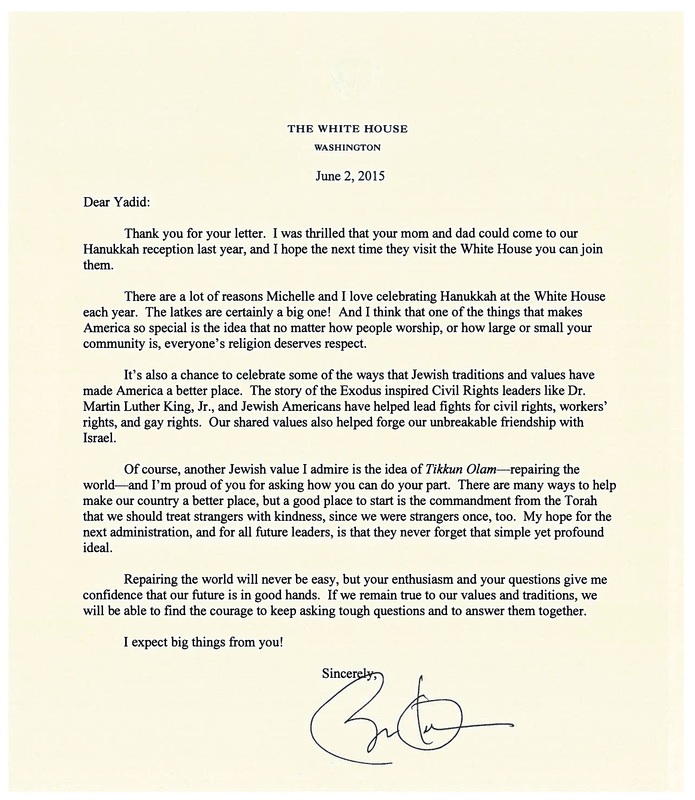 Back in December Adina and I got invited to the White House for a Hanukkah party. It was a great experience for the two of us. It also prompted a great conversation with Yadid. 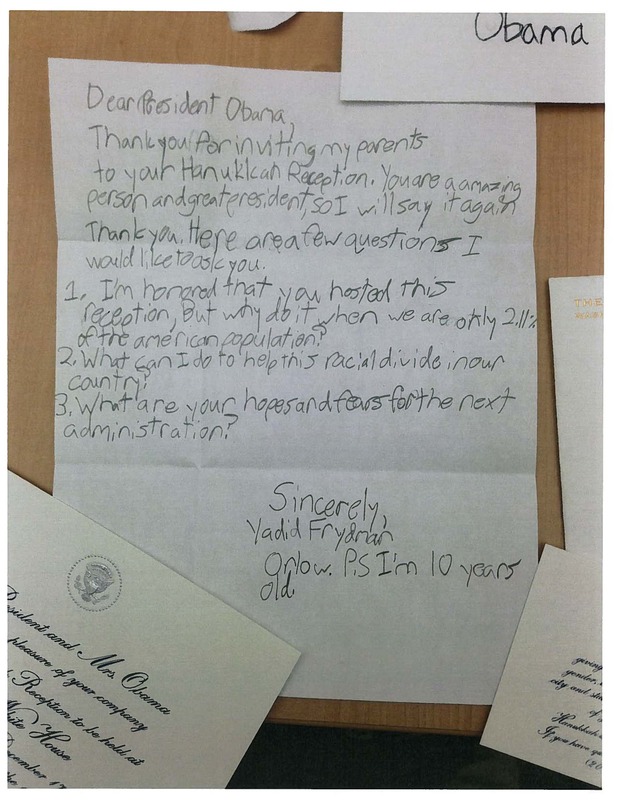 At the time I shared his letter he wrote to the President. I am proud that he had the idea of writing the President. I was honored to serve as his shaliach, emissary. Recently we received a response. I thought some of you might like to see the response. What a lovely response? We are very proud of our son and proud to be Americans. It was really nice sharing this experience with Yadid. He still thought it was a big deal, even though Yadid is now 11 years old. Today I was on the bus ride home when I thought to myself something, in my opinion interesting question. What makes us believe what we believe? Why do we believe in God and not gods or kings? Then my self-conscious answered “because that’s what we choose to believe and we can’t be judged for that. We might disagree but we can’t fight about it. Because that would cause another world war, you wouldn’t be able to trust even your family and there will be no prosperity”. So my self-conscious said this, ” Never stop believing because if you do you may never believe again”. My self-conscious responded “no I am saying that you shouldn’t be a terrible person because the world doesn’t follow what you believe because theirs no point”. I share this here in recognition that it was a cconversation with Yadid and his self-conscious that prompted me to start writing this blog over five years ago. When my son Yadid was four years old he came home from daycare and reported to me that he got into trouble. He got put into timeout for throwing sand at another child. Yadid said,” Myself said to myself, I do not want to be in timeout. Myself said to my cry, I do not want to cry”. And with that we started a conversation about his conscious life. It seemed only fitting to continue that conversation with a blog with the same name. My son spoke in the words of Ecclesiastes, “I said in my heart: ‘Come now, I will try you with mirth, and enjoy pleasure’; and, behold, this also was vanity.” (Kohelet 2:1) My mission is to model a life that is personally meaningful, universally relevant, and distinctly Jewish. I aspire to be frank and to speak of Torah in real life. It is wonderful to pause for a moment to realize how this discussion has evolved over time. Yadid is almost 11. In the last five years I have grown in many ways in forcing myself to find a voice for my parenting, my Torah, and my self-conscious. In many ways I think it would be helpful for more people to force themselves to be more intentional and explicit. Thank you Yadid. These words are familiar to many of us. We rarely stop to think about what they mean. Surely we are even less likely to stop to ask why we cover our eyes when we say the Sh’ma? One explanation is that for the Jewish creed, there is a presumption that God has no form. It follows that our deepest faith is in something that we will never experience with our eyes. In covering our eyes it is as if we are saying, “I believe in You/you even when I do not see You/you”. To what degree is this true for us in other relationships in our lives? Do we feel like we are part of this community even when we do not see each other? On Monday we are sending our eldest child to overnight camp for the first time. Do we trust him even when we do not have an eye on him? Do we trust the staff of the camp to take care of him? The answers are yes and yes. And further, camp is an amazing place in which he will be able to explore “these words” at all points of the day and in all media of expression. It is important that our son has the space to explore Judaism and his role in the community beyond our watchful eyes. I am confident that giving him this own space at camp will ensure his commitment to the Jewish project. The only question is how he will he keep connected with his camp friends after the summer when he can no longer sees them.